Relax and enjoy the charms of downtown Mystic. Located on the historic property of Captain William Morgan, an 18th century sea captain, this private Carriage House is situated just a 1/4 block from downtown.. in the heart of Mystic, but also quiet & secluded. A very 'Norman Rockwell-like' setting! There are two suites for rent. These are side by side but not connected. Both back up to the private terrace behind with beautiful gardens. The larger suite sleeps three with a king bed and smaller full size futon. The smaller with a king bed sleeps two. Next door on a separate lot is the Captain Morgan House. This sleeps up to ten and can be seen on HomeAway listing # 985419. For larger groups renting both the Carriage House and Capt. Morgan House is a great option. Welcoming Basket, Breakfast, etc. : I would be happy to arrange a special welcoming basket to suit your needs upon your arrival. Please phone ahead to discuss this with me. Various themes could include birthday, anniversary, engagement, girls weekend away!, etc. I am also happy to stock your refrigerator... just ask. Arrangements can be made to have a deluxe continental breakfast basket brought to your door in the morning. Again, please arrange this ahead of time. 'The Honeymooners', 'It's YOUR Birthday', 'Halloween Hauntings', 'Christmas is Coming' and MANY more! I am also happy to work with you to create a customized get away package! Some items contained in these special get aways are.... spa treatments, restaurant dining, chartered boat trips, cocktail hour food & drinks, greeting baskets, breakfasts delivered to your door, biking, kayaking, picnic baskets, Holiday activities, ETC. These weekends can be for 2-6 people and the rate varies per person according to the activities desired. Most of the activities are within walking distance from the Carriage House. Please call me to discuss the options. Year Round Activities....: Mystic is lively not only during to summer but YEAR ROUND.... I decorate the Carriage House seasonally to create a wonderful atmosphere.My various getaway packages reflect the different holiday moods and include many activities such as the Holiday Shopping Stroll & Mystic Seaports 'Lantern Light Tour' in December....'Haunted Happenings' in October, winery tours, etc. I have many suggestions and I love to celebrate the holidays! Hi! I've been renting the Carriage House since 2002. I have met so many wonderful people over the years! I am also happy to say that many great memories have been created here. I have a degree in graphic design and art education enabling me to add many creative touches to each suite. I am also a people person so I love my job! Hope you can share my beautiful space! I am an artist by trade and have decorated each suite & bath with great care. They are unique and beautiful. .Both bathrooms have an oversized soaking tub with a rain shower...and plenty towels! The Mystic River runs one street Behring Pearl Street. There is space to park one car per suite off street. Please park so that a third car may fit. This is a very private unit within walking distance to downtown Mystic (1/4 block). The river is along the next street. Parking is off street - directly in front. I am located in the historic district of Mystic...a great area to stroll. The home is located only 10 minutes from Foxwoods Casino and 20 minutes form Mohegan Sun. Sue is a gracious house and we had everything we needed. The dogs were very happy, too! Very clean, very comfortable, and really convenient to downtown mystic! Very cool place to stay! 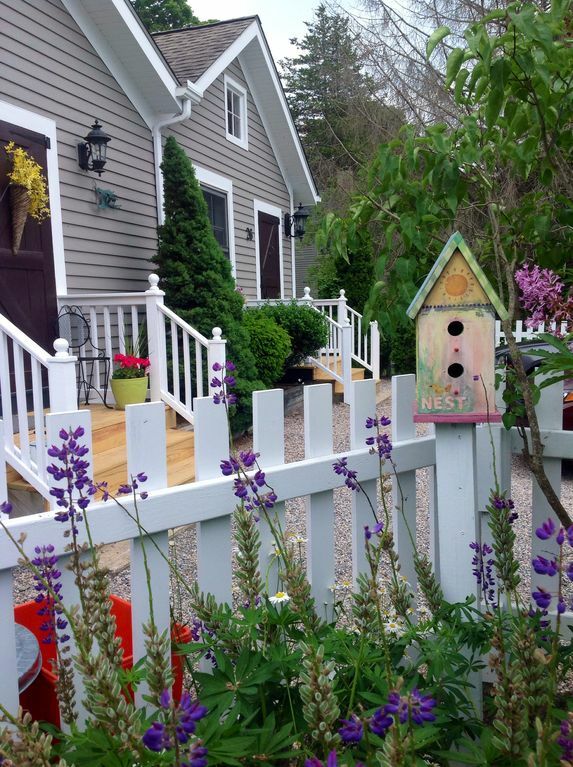 Great cottage in the perfect location if visiting Mystic. We’ve stayed here a few times already and it’s always our go-to. Highly recommended! I am so glad we found Susan's place, she will be my first choice next time we are in Mystic. The space had everything 2 people could need and them some and all set in a perfect, lovely location. We walked everywhere and enjoyed breakfast on the patio. Carriage House -- Cute and Convenient! We stayed two nights in Mystic, visiting my mother. We decided to try something a little different from a standard hotel, and found this property, a very short walk away from the Assisted Living place my mother is at. It worked out great! Very nice place -- charmingly quaint in some ways, yet large (including a bed large enough for a 6' 5" man), and very nicely appointed. Really convenient to downtown as well -- we took the train from NYC, and managed to get by without renting a car for our stay. But just far enough away to be quiet. I want to also note that Susan was very helpful: I left an Android tablet computer that I use a lot when we left, and she packaged it up and got it in the mail to me very quickly. We enjoyed our stay here. Comfortable for two nights and a great location! Also very clean .! The following are a very short drive from the Carriage House: the Mystic Aquarium, the beautiful coastline of Connecticut & Rhode Island with many beaches & state parks, Foxwoods & Mohegan Sun Casino's, wineries, hiking, & tennis to name a few. Also, the town of Mystic offers many different seasonal activities year round. If I can offer any further information please feel free to call or email. I can also arrange a welcoming basket to fit any occasion, just ask! Best wishes! $150-$250 / night based on double occupancy...will vary according to season & length of stay Off season rates may be negotiated CANCELLATION POLICY: Cancellations up to 30 days prior are subjected to a $100 fee per suite. After 30 days prior to your stay you will be responsible for 100% of your total charges. I will do my best to re-rent your suite.